Lee Johnson got off to a winning start as Bristol City boss as Aden Flint's double gave them victory over Ipswich. The centre-back rose highest to head in off the post from Luke Freeman's pin-point corner to open the scoring. It was 2-0 when, in similar fashion, Flint nodded in Freeman's delivery for his fourth league goal of the season. Ex-Robin Brett Pitman scored for Ipswich with a low finish, but City held on for back-to-back wins and moved five points clear of the drop zone. Johnson played for the Robins from 2006 to 2012 and will be delighted with his start after joining from League One side Barnsley on 6 February. The first half could have yielded more goals for the hosts as Ipswich goalkeeper Bartosz Bialkowski made an excellent one-handed reaction save from Korey Smith's deflected shot. Ipswich also had chances, with home goalkeeper Richard O'Donnell saving well from Daryl Murphy's six-yard header midway through the second half. The hosts nearly extended their lead but Bialkowski made a low finger-tip save from substitute Kieran Agard to keep it 2-1, before Tommy Smith's late drive flew wide. "There is still work to do, but it was a good start. A lot of what I saw really pleased me. "We have some big lads to attack set-pieces and Luke Freeman's quality of delivery makes it easier for them. 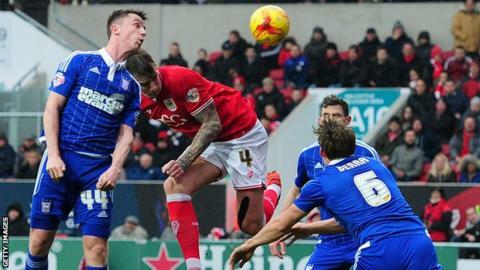 "Aden Flint was brave with his headers. At half-time he told me he wanted to take a penalty if we got one - but I wouldn't have let him! "The atmosphere created by the fans was tremendous and I really appreciated that. Now we have to maintain focus in and out of possession. If we do that we have the quality to hurt opponents." "We didn't defend the set-pieces well enough, but credit where it is due because the delivery and movement at the two corners was an example to any young players. "Having gone behind, it was needs must and we switched back to 4-4-2, which I felt made us more effective. "Brett Pitman wants more starts and he made us better when he came on. He doesn't like the tag of super-sub, but it was a great finish. "We have been hit hard by injuries in midfield, which is not an excuse. I expect us to be challenging at the top of the table and can understand the fans' frustration." Match ends, Bristol City 2, Ipswich Town 1. Second Half ends, Bristol City 2, Ipswich Town 1. Richard O'Donnell (Bristol City) is shown the yellow card. Attempt missed. Tommy Smith (Ipswich Town) header from the centre of the box is close, but misses to the left. Assisted by Jonas Knudsen following a set piece situation. Substitution, Ipswich Town. Larsen Touré replaces Kevin Foley. Substitution, Bristol City. Scott Wagstaff replaces Joe Bryan. Offside, Bristol City. Aaron Wilbraham tries a through ball, but Kieran Agard is caught offside. Attempt blocked. Joe Bryan (Bristol City) left footed shot from outside the box is blocked. Assisted by Kieran Agard. Offside, Ipswich Town. Luke Chambers tries a through ball, but Daryl Murphy is caught offside. Attempt missed. Joe Bryan (Bristol City) left footed shot from outside the box is high and wide to the left. Mark Little (Bristol City) wins a free kick in the defensive half. Attempt missed. Tommy Smith (Ipswich Town) left footed shot from outside the box misses to the left. Attempt missed. Aden Flint (Bristol City) header from the centre of the box misses to the right. Assisted by Marlon Pack with a cross following a corner. Corner, Bristol City. Conceded by Kevin Foley. Attempt blocked. Kieran Agard (Bristol City) right footed shot from outside the box is blocked. Kevin Foley (Ipswich Town) is shown the yellow card for a bad foul. Foul by Kevin Foley (Ipswich Town). Corner, Ipswich Town. Conceded by Marlon Pack. Attempt missed. Korey Smith (Bristol City) right footed shot from the right side of the box is close, but misses to the left following a corner. Corner, Bristol City. Conceded by Bartosz Bialkowski. Attempt saved. Kieran Agard (Bristol City) right footed shot from the left side of the box is saved in the bottom right corner. Assisted by Scott Golbourne. Hand ball by Aaron Wilbraham (Bristol City). Attempt missed. Nathan Baker (Bristol City) header from very close range misses to the right. Assisted by Marlon Pack with a cross following a corner. Substitution, Bristol City. Kieran Agard replaces Lee Tomlin. Corner, Bristol City. Conceded by Ben Pringle. Goal! Bristol City 2, Ipswich Town 1. Brett Pitman (Ipswich Town) left footed shot from the left side of the box to the bottom right corner. Assisted by Daryl Murphy.